It is HARD to find good toddler recipes, meaning things that can be made ahead and reheated, things that aren’t complicated, things that my toddler will actually EAT. 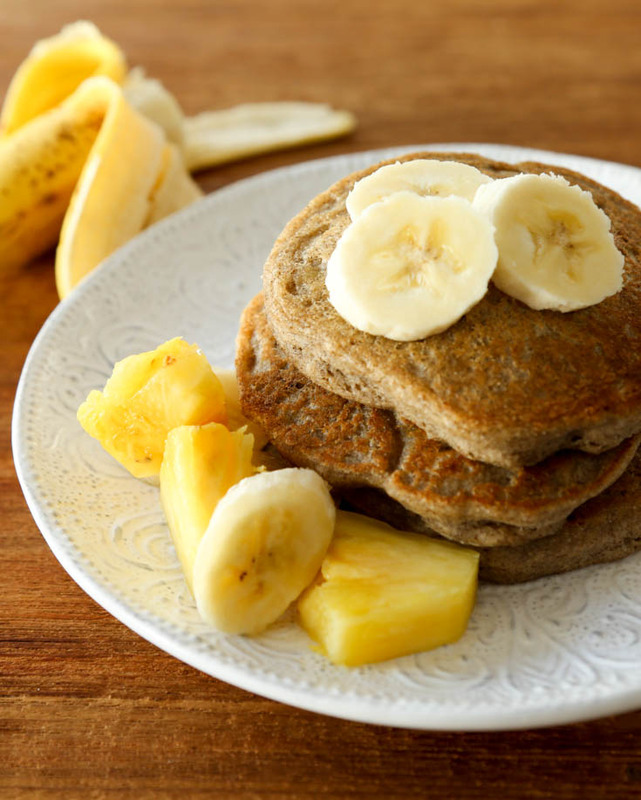 I started making these egg-free banana pancakes for Flint when he was about eight months old. He had a bad reaction (an instantaneous facial rash) to eggs when he was six months old and we were advised not to try again until he turned a year. Thankfully, he did outgrow the allergy and now can eat anything he wants, so I’ve added eggs back into the recipe for a little more protein. Made without egg, the pancakes are thinner and a little more delicate; made with egg, they are thicker and puffier and fairly sturdy. 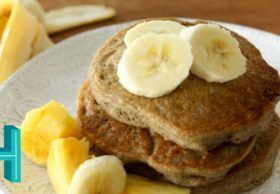 Besides the fact that these banana pancakes can be made without eggs or with eggs, the other marvelous thing about pancakes for toddlers is they hold up GREAT in the fridge for a week. Cook, cool, then layer between waxed paper and store covered. Reheat in the toaster for a quick breakfast. You definitely want to layer some waxed paper between them because they will stick together otherwise and ruin your morning. If you want to freeze them, you can do that, too! Again, single layer of pancakes on wax paper or parchment, freeze solid, then store in freezer bags or boxes. Thaw as needed. I use a combination of whole wheat flour and buckwheat flour for variety, but these can be made with all whole wheat flour, all buckwheat flour (for gluten-free pancakes) or even all-purpose white flour. Flint LOVES these pancakes spread with a little peanut butter or other nut butter, and he also likes to dip them into whipped coconut cream. Banana pancakes recipe – printable! Mash banana in a large bowl with a fork until it’s mostly smooth. Mix in egg if using. Add milk, oil and vanilla and stir well. Add dry ingredients and mix quickly. There may be some lumps. Lightly oil a griddle and heat over medium until it sizzles when a drop of water is flung upon it. Portion batter by large tablespoonfuls spreading the batter out if necessary to make a circle about 2 inches diameter. Cook until the edges begin to look dry and bubbles form around the outside. Use a spatula to flip each pancake and cook another 1-2 minutes until brown and crispy. Serve pancakes hot with butter and syrup or cool and refrigerate. Pancakes can be reheated in a toaster or toaster oven. Use 1 1/4 cups whole wheat flour if you don’t have buckwheat flour. Or use another flour in place of the buckwheat flour. I was skeptical, but tried it, and they were great! So happy to hear that, Zeek! My son had the same except I think still allergic I haven’t tried again do you have any more suggestions from your experience? Like other recipes? Some other egg-free foods he likes are sweet potato fries, quesadillas. There is a vegan egg replacer you can buy called Ener-G that works pretty good to adapt other baking recipes, too. Good luck! Hope he grows out of it.